This is your place for all things HubSpot CRM-related. Majority of your interactions with prospects will be logged in the contact record. This area covers most frequently asked questions regarding contact records but some can be used interchangeably for Deals & Companies. If this is the case, it will be noted at the bottom of the answer portion. How do I view only my contact records? You can narrow down your search and see all contacts assigned to you by Navigating to the Contacts and selecting "All Saved Filters" > "My Contacts". This filter is filtering by HubSpot Owner and will only show contacts that have you are assigned to as the Owner. Please follow the same steps for Companies & Deals. How do I see my most recently assigned contacts? Navigate to Contacts. Here you can filter your results by viewing your most recently assigned contacts. Click on 'All saved filters' > select 'My contacts'. Once your filter has been set to only show contacts where you are the HubSpot Owner, select '+Add filter', on the left sidebar, to narrow your results even further. Click '+Add filter' > Search 'Owner Assigned Date' > Click the radio button next to 'is' > select your time frame. You can narrow the results down by today, yesterday, this week, last week, ext. Follow these same steps for Companies & Deals. How can I view more properties than the ones found under the About section? In each contact record, the information shown in the About section is not limited to what you see there. To view additional properties, scroll to the bottom of the About widget on the left side of the page. You will see a 'View' drop-down, click on the drop-down > Select 'View all properties'. Follow these same steps for Company & Deal records. What are my triggers for moving a contact through the funnel? Your system was built so that "Training Status" and "Lead Status" are your triggers. This means that by updating these properties within the contact record, automation will move the contact through the funnel while updating the Lifecycle Stage, and also at a specific deal stage, will also be updated. 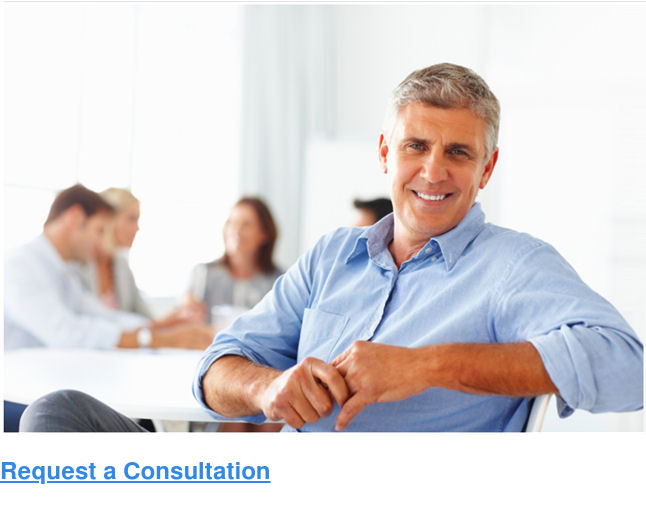 Although you will be working the contact records, there may be times when questions regarding company records arise. Reference this section for all HubSpot company record related questions. How are contact & company records associated? When a contact enters the CRM system, HubSpot will automatically associate the contact's email domain name and match it to the Company's Domain name. If a contact enters the system with a freemail service such as @yahoo, @hotmail, or @gmail - no company association will be made. In this case, you will need to manually attach the company record to the contact record. How to add a company manually to a contact record? Within a contact, the record is the Company widget. This widget can be located on the left side of the screen. At the bottom of the Company widget, there will be a button that says 'Add a company'. Click here to add the company record. You will have the option to search by name or domain. Once you find the correct company, simply click 'Select' next to the company name. If your company does not exist within the system, you will have to select 'Create a company' to manually input it into the CRM system. How to create a company record & associate it to a contact record? Navigate to the Companies page. Here you can manually create a new Company record by clicking 'Add Company' in the top right-hand corner of your screen. When a new screen opens, start by entering the company domain name and the company name. As you enter in the domain name you will see that most properties will start populating on their own through HubSpot Insights. Update any missing information. Then select 'Create company'. 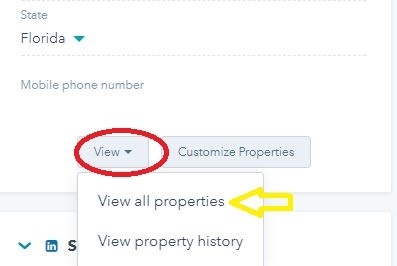 You will be taken to the Company record where you can add more information under 'View' > 'View all properties' or attach associated contacts by scrolling down to the Contacts widget. To associate a contact within a company record, select 'Add a contact' and search by email address or name. Then select the checkbox next to the correct contact record. Remember: You can associate more than one contact record to a company record, but not vice versa. This section covers all HubSpot related activities such as notes, tasks, meetings, calls or emails. How do I create a task from a contact record? Navigate to the contact record in which you would like to create a task for. Within the record, at the top of the page, you will see options for New Note, Email, Call, Log Activity or Create Task. Select 'Create Task'. A drop-down will appear where you can enter the task name and add notes. Within the task, over in the top right-hand corner, you can update the due date. At the bottom of the task, you will see options to update the type, whom it is assigned to, and set an email reminder. The 'Assigned to' will automatically populate to your name, but you have the option to update that to anyone on your team as long as they have a HubSpot account. Lastly, notice the very bottom of the task where it says 'Associated records'. If you don't want this task to be placed on the company record, simply click the 'x' next to the company name. If there is a deal associated with this task, simply click 'Add a deal'. Can I assign and edit a task for another employee? Yes, there are two ways to create tasks. Either by navigating to the Task page and selecting 'Create a task' or by creating a task directly in the contact record. In the contact record, at the top of the record, select 'Create task'. Towards the bottom of the task, you will see 'Assigned to'. This field will automatically populate to your name, but you have the option to update that to anyone on your team as long as they have a HubSpot account. 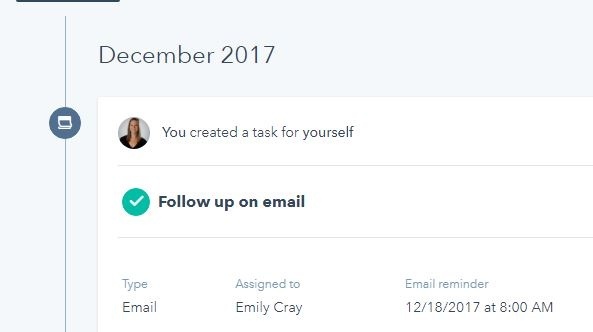 Once you assign a task to someone else, they will receive an email notification with a link that will take them directly back to that contact record. How do I communicate internally in contact, company or deal records? HubSpot offers 5 types of sales activities in contact, company & deal records - Notes, Tasks, Email, Calls, and Meetings. The first two mentioned notes & tasks should be used as internal communication. When you create a New Note you can also @ mention another HubSpot user. Whenever you @ mention another HubSpot user they will receive an email that with direct them back to the contact record. To use the @ mention feature click on the 'New Note' tab in the contact record. First, type the @ sign and then start typing your team members name until their name shows up on the drop-down. Tasks are another useful tool for communicating internally. For example, you need a colleague to follow up with promotional content or discuss product information. If you select 'Create task' in the contact record you can assign a task to someone else and enter in the due date. Both of these types of communication will be stored in the contact record for easy reference for a later time. HubSpot will also send your team member an email notification for a quick click back to the contact record. Fun Tip: You can Pin a Note to the top of the Timeline if you know you will need to reference it again in the near future. How to manage your tasks through a Queue? In your Tasks page, you have the option to create task queues. Using task queues in HubSpot CRM will help you organize your similar tasks into one place and cycle through them for easy task completion with a lot fewer clicks. Navigate to your Tasks and on the left sidebar click 'Add a queue'. Name your Queue and then click save. 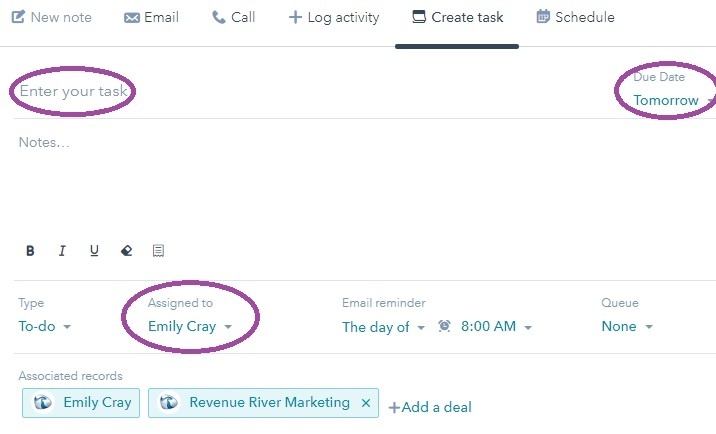 You can add tasks to your queue at the time of creation in a contact record or directly from your tasks page. Once you have tasks in your queue you will click 'Start Queue' in the top right-hand corner of your task queue page. This will start the process of taking you through each task one by one by automatically navigating you to the associated contact records. For each task, you will have the option to check the task complete (found in the contact timeline) or select 'Skip' if you are unable to complete the task at that time. How do I send & reply to an email in the CRM? First, you will need to make sure your email has been integrated with HubSpot. To do this go to 'Settings' > 'Email Integration' > 'Connected Emails' > 'Connect an Inbox'. To send an email, navigate to the contact record. In the engagements box at the top of the record, select 'Email'. Type in the Subject, select an email template if necessary, and confirm you have the correct email address in the 'To' field. If the contact has two email addresses you will have the option to update the email by clicking on the drop-down next to the recipient's name. Once the email is sent it will be saved in the contact's timeline. To reply to an email within the CRM, simply navigate to the email in the contact record and select the 'reply' button. These same steps can be replicated in a company or deal record. How do I make sure my email gets recorded in the CRM? To directly Log an email in a contact record you will need either have a Gmail account or Outlook 365. If not, you will have to create a BCC email address and attach it to each email so it gets properly associated to the contact's record in HubSpot. To learn more about this process reference this article from HubSpot. When you create an Outlook email there will be an option at the top of the email to 'Log' and 'Track' the email. Make sure both of these checkboxes are selected. Then click 'Send'. Remember: If you uncheck this box at any time it will stay unchecked for future emails until you recheck the box. The HubSpot calling feature lets you call your contacts directly from the CRM and record your call. Simply navigate to the contact record and select the Call option from the list of engagements at the top of the contact record. If you have not connected your phone to the CRM system you can do so within the contact record. Navigate to the Call tab and select 'Start calling'. 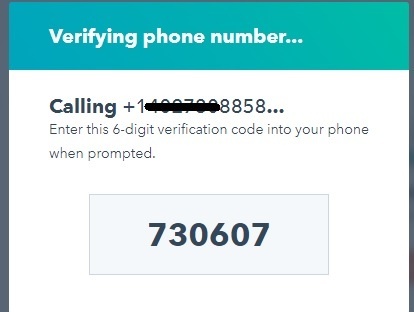 After you register your phone number you will receive a call from HubSpot and be prompted to enter in the validation code that is provided. 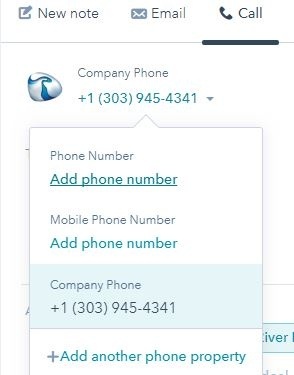 If your contact has multiple phone numbers, you will have the option to select which number to call them at before you place your call. Lastly, make sure to confirm whether or not you will be taking your call from your phone or browser. Remember: If you are calling a state that requires two-party consent you will have to enable recording manually after you get the consent from the other party. You have worked the lead and now they are interested in a sales deal. All questions related to deals will live here. How do I see all of my open deals? The deals filters are set up similarly to contacts. To see all of your open deals navigate to the deals page. From there click on 'All saved filters' > 'My Deals'. This will filter all deals where you are the HubSpot Owner. If you want to see deals assigned to someone on your team you can select 'Add filter' > 'HubSpot Owner'. Then type in their name. What crucial information must be associated with all deals? Contact: The contact record for the main point of contact should be associated on the deal record. 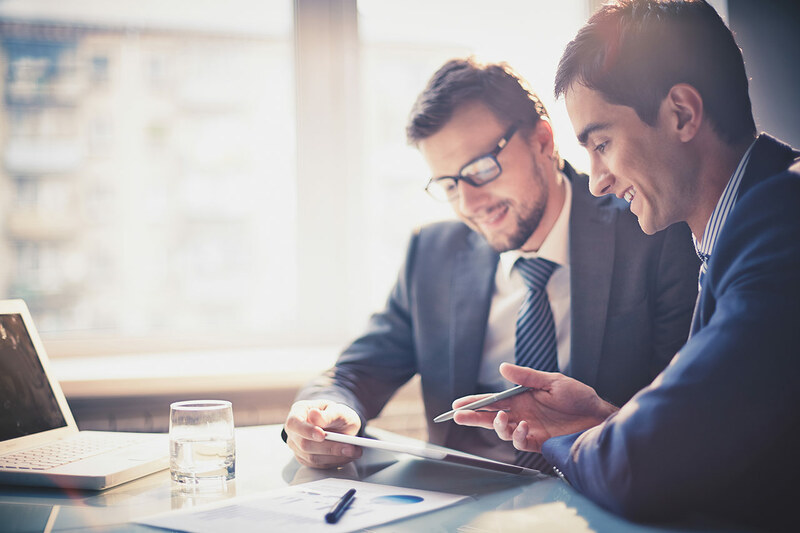 More than one contact can be associated to a deal. Include all major decision makers. Company: The name of the organization that your contact is representing. Only one company can be associated with a deal record. Amount: The amount of the sale. This value can be added in the top right-hand corner of the deal record or in the About widget. This will affect goals & forecasting if not input accurately. Lead Type: Lead Type is a property found in the contact record. **For a contact that has been worked from a lead status of 'New' their deal will automatically be created when their lead status gets updated to the 'Open Deal'. Through automation, the contact & the company will be associated with the deal record. This section covers questions related to how to use your Sales Pro tools such as Templates, Meetings, Documents & Sequences. What are Contact & Company tokens and how do I use them? Tokens are a great way to personalize your templates or snippets by using corresponding properties from contact and company records within the CRM. As long as the property is known, then the token will populate once you insert a snippet or template. When editing a template, scroll to the bottom of the template and in the bottom right-hand corner you will see 'Token' in blue text. Click here to search for the specific token you want to insert. One of the most commonly used tokens is 'First Name' and 'Last Name'. If you want to add the Company Name as a token, make sure to use the Company token 'Name' instead of the contact token 'Company Name' to ensure that the Name of the Company will populate each time. To insert a token into a snippet navigate to the snippet you want to update and click 'Edit'. Under the text box, in the bottom right corner, will be blue text that says 'Tokens'. Click here to insert the contact or company token you are looking for. When deciding which tokens to use for snippets, consider which properties you are manually typing out the most. Again, the most common will be First Name, Last Name, and Name of Company, but other ones might be Field Type, Account Number, or Special Program Account Manager. How do meeting links sync with my Outlook Calendar? Once your Outlook Calendar has been integrated with the Meetings tool then Contacts will have the ability to book meetings, and have direct access to your availability, without the back and forth emails. 1. First, you will need to create your customized meeting link. Create different links based on different meeting types. 2. You must set the availability in the meeting link settings for open times and dates to show up in the link. 3. For events that are on your Outlook Calendar, the 'Show As' property must be set to 'Busy' to prevent any double booking. If events on your Outlook Calendar Show As 'Tentative' or 'Free' then those times will still be available within your meeting link. 4. Set Buffer Times and Duration Times in the meeting link settings to control how long your meetings last and give yourself some time to regroup before your next meeting. These options allow you to stay in control of your Calendar. How do I use templates straight from Outlook? A major benefit of Templates is the ability to send them straight from Outlook. As long as you have the HubSpot Sales Add-in installed in Outlook then you will have access to all the Templates that live in the CRM when sending an email to a contact. When sending a template from Outlook, you need to remember two things. You must be replying or creating a new email for the Template options to show. The person you are emailing must already be a contact in HubSpot. If they are not a contact in HubSpot, then your contact & company tokens will not populate. 1. Open up a new email either by hitting reply or creating new. 4. When the new window opens up, select 'Templates'. 5. Another window will open giving you access to all of the Templates that have created in the CRM. Either search for the specific Template you want or select 'View All Templates'. 6. Once the Template has been input into the email, double check that all tokens have been populated correctly and the subject line make sense. If you are replying to an email, the subject line in Outlook will not update with the subject line from the Template. 8. Hit send & track the progress of your email opens & clicks. What are snippets and how can I use them? Snippets are short, reusable text blocks that can be used for contact, company, and deal records. 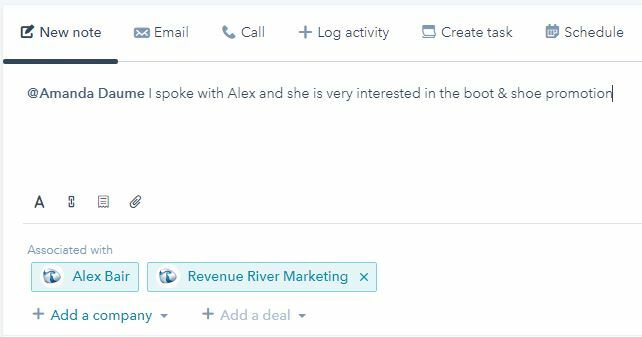 Use snippets to leave notes about prospects in the CRM. Go to Sales Tools > Snippets > Create. Give a Name for your Snippet and then enter your text in the Text Snippet box. If applicable, use tokens to pull in contact data based on known contact & company properties. Last, give your snippet a shortcut by creating an identifiable hashtag. When in the contact record, create a note, and input your snippet hashtag. The phrase used in the corresponding snippet will populate into the note.